Low-fat cinnamon crackers topped with crushed pineapple and fresh strawberries make for a delicious Healthy Living recipe for a crowd. Mix pineapple and dry pudding mix in medium bowl. Gently stir in whipped topping. Refrigerate at least 30 min. Spoon 1 Tbsp. of the pineapple mixture onto each graham square just before serving. Top each with a strawberry slice. To serve as a spread, prepare pineapple mixture in serving bowl. 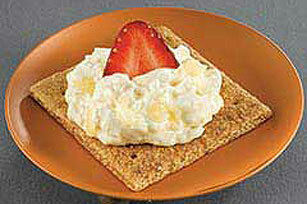 Top with 1/4 cup chopped strawberries. Serve as a spread for the graham squares. Pineapple mixture can be stored in airtight container in refrigerator up to 5 days.